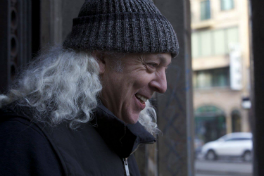 David Torn (AKA “splattercell”) is a film-composer, producer, ECM recording artist & guitarist/performer, known for his ex- pansive musical voice, which seems to bridge a naturally & idiosyncratically wide variety of idioms, styles, periods & con- texts. His groundbreaking textural work has had material im- pact & influence upon both film scoring — through his own scores, & through the great number of his original contribu- tions to the scores of other composers — and more broadly, upon electro-acoustic & electronic music & its current musical technologies. David’s first studio film-score, “The Order”, was nominated for a Grammy award. His substantial creative contribution to “Traffic” created for a notably groundbreaking & influential sound. He also scored Friday Night Lights, Lars & The Real Girl, The Wackness, Everything Must go, Anvil: The Story of Anvil, Saint John of Las Vegas, The Line (La Linea), Teenage Paparazzo, Believe in Me & etc. His contributive work has graced the sheerly musical output of other artists as unusually diverse as David Bowie, Jeff Beck, Sting, Mick Karn, David Sylvian, John Legend, Tori Amos, Tim Berne, Madonna, Meshell Ndegeocello, Jan Garbarek & Eberhard Weber, Jarboe, Manu Katché, Laurie Anderson, Kaki King, kd lang, Chocolate Genius, Don Cherry, Ryuichi Saka- moto, Tony Levin, Drew Gress, Julie Slick, David Douglas, & et cetera.As well, David has played a key creative role in noted scores of other film-composers, including those of Carter Burwell, Howard Shore, Cliff Martinez, Ryuichi Sakamoto, Theodore Shapiro, & a number of other film-composers who continue to employ samples of his textural work.His education included study with Leonard Bernstein (within the “Music for Young Composers”-Series), John Abercrombie, & Pat Martino. He has been the recipient of several awards, including: 2 Grammy Awards, The Cowboy Award Best Score (Jackson Hole Film Festival), a Bronze Axis Award (NZ), 3x Readers’ Poll Awards from Guitar Player Magazine, in addition to a number of other international awards & nominations. By invitation, David has conducted 2 Master-Classes at the California Institute of the Arts, and some select workshops in the USA, England, Japan & Brasil, as well as being a sought- after private consultant to specific areas within the burgeoning sector of Music Technology Manufacturing and R&D.